Shenzhen is a city of Guangdong province in Southern China. 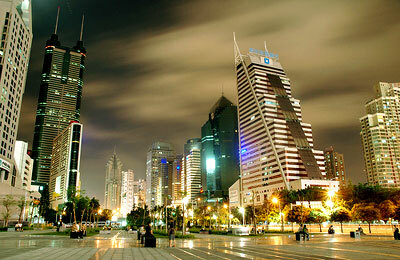 Being located at the border with Hong Kong, Shenzhen has indeed become one of the fastest growing cities in China. The city has many more factories than the Midwest and is considered to be the busiest port in the whole of China. Investors has been investing alot for the past 2 decades in building factories and forming joint ventures. Having a good reputation for shopping and travel, Shenzhen boasts several spectacular scenic spots. Its major tourist attractions include the Chinese Folk Culture Villages, the Window of the World, Splendid China and the Safari Park in Nanshan district, the Sea World in Shekou, the Dameisha Promenade and Xiaomeisha Beach Resort in Yantian district, Zhongying Street, Xianhu Lake Botanical Garden, and the Minsk World. DAY 01 - SINGAPORE - SHENZHEN (D) - Depart Singapore and arrive at Shenzhen Airport. Meet with our local representative and transfer to hotel. (Optional Tour) Dinner will be provided. DAY 03 - SHENZHEN - SINGAPORE (B) - After breakfastat hotel, it will be free leisure until time to transfer to airport.